You'll be £5.20 closer to your next £10.00 credit when you purchase London Curiosities. What's this? How many of those who walk past Cleopatra's Needle pause to consider why a 3,000-year-old Egyptian monument stands beside the Thames? How many know that what was once London's smallest police station can be seen in Trafalgar Square? Or that pineapples are used in the architectural design of so many buildings? Or why there are memorials to the 'Mayflower' and Pilgrim Fathers in Rotherhithe? Are you planning a vacation to London and you don't know what to see apart from Buckingham Palace, Saint Paul Cathedral and some other famous locations suggested in a common tour guide? Don't despair: bring with you London Curiosities and once you return home you will have wagons of pictures to share with your friends, and many interesting anecdotes and places that you will have visited. ★★★★★ If you are planning a visit to London, then you should definitely take a look at this book. It is packed full of unique pieces of London’s history. These are the places that you won’t find in the typical tour guide. The book is organized into categories including Surprising Building, the Pineapple Trail, Tunnels Under London and many more. The text was an easy and enjoyable read and there are pictures of everything mentioned. If you’ve been following me, you know I like the odd and quirky and this book totally nailed it for me. I will definitely have it in my bag if I find myself in London again. Top marks to the author for putting this together. Gathered quite the list of unusual things to see when I return to London next year - and here's me thinking I'd seen it all! Loved this! I'm heading to London in just over a week so this was a great read to prep for that. As an ex- Londoner, I love to read factual and fiction works centred around the greatest city in the world. There are many books on the market that deal with the social and political history of London, but the joy of London Curiosities is that it highlights the small details of history that can be seen all around you. For example, for many years I worked next door to the church of St Magnus the Martyr, but never knew its connection to London Bridge and the evidence of that visible in its churchyard. I would recommend this book to Londoners but also to visitors who want to enjoy the little surprises that a walk in London can throw up. A great read! This is such a cool book! Its a listing of all the odd left overs from buildings, bridges, or odd historical relics that have been left around the city of London. The chapters break down various categories such as Clocks, Monuments and Memorials, Roman Remains, etc. This is a fascinating book that looks at all of the hidden treasures around London. The author obviously knows the city well and takes you on a comprehensive tour. The book will delight those that do not know London and those that live their equally. This amazing book will be of interest mainly to people who live in London or who intend visiting for pleasure. Some real gems inside, genuine surprises, too! With its narration middling somewhere between a guidebook and a info-historical documentary, this book points out the first, the last, the smallest, the biggest, and the most unusual structures & areas of London. My favorite and most remarkable references were to the last sewer post (a light powered from bio-gas), a nose installed onto the side of the Admiralty Post in 1997 to mock the presence of closed-circuit cameras, the Pineapple Trail (due the symbolic presences of pineapples to show that a sailor was at home and safe), the Park of Unsung Heroes at Postman's Park, all of the art in Alfred Hitchcock's hometown of Leytonstone, Roman relics, and Oscar Wilde's bench near Charing Cross station. I enjoy spending time in London and as a student, I took part in a Dickensian tour of the city. Wade's book of interesting architectural and cultural facts is a fun illustrated companion to the streets of London. This provides a fantastic introduction to the secret spots of a setting that I have come to take for granted and I am now looking at the city with fresh eyes. I shall be buying a hard copy of this for my husband as he loves London and has enjoyed many books and documentaries - he will certainly be pleased to add this to his collection. An accessible and engaging read for fans of Ackroyd's London. There can be few people on the planet who can't name at least a handful of London's landmarks, and quite likely to know some of it's rich history: Likewise I'm sure there are many people who think they know an awful lot about the more unusual places and sites in the capital. However I'm certain that very few people will be familiar with even a fraction of the contents of this truly fascinating book. Who knows how many thousands of guide books have been produced over the years but "London Curiosities' must surely be not only one of the most original in content, but also one of the most engaging. This book is not a history lesson, but a celebration of eccentricity and achievement, and details the occasionally weird survivors of long forgotten events and people. What other book contains chapters on pineapples, portly film directors and police boxes? Not even remotely a history lesson (the only fact that is sometimes repeated is that London more or less burnt down in 1666) the book consists of a series of related themes covering diverse subjects as the narrowest/smallest/upsidedown-est buildings, why bollards are cannon shaped, why there are giant noses at specific sites and a section on the last surviving methane burning street lamp! The beauty of this book is that there is just enough information to spark your interest without any one subject over staying its welcome, while the writing is wonderfully informative and jolly at the same time. The neat thing is that for most of the curiosities contained the author has photographed them especially for the book, and has also used period illustrations to show the thing in it's glory days - particularly useful when you are trying to imagine what the bit of greek stonework signified originally! As another reviewer noted this book would be a fantastic guide as an alternative to the run of the mill guides if visiting the city, but equally as an armchair guide it's a delight. There is a full post code listing at the back, but I'd suggest for a future edition they add a great big fold out map with each site marked with a red dot to help the few of us who don't have a sat nav! Love London? This is for you. Love excentric facts? This is for you as well. I know London but there is so much to know about certain things that I am starting to think I know nothing (Jon snow… pun intended). I loved every inch of this book, and now when I walk in London I will have to search for these facts. Great book for a great read from John Wade. This is what I call a coffee table book. One that you read at the start but then keep going back to refer to snippets and rediscover the information. Since I read this I immediately put an order in for myself and for two of my family that live in London and am keenly awaiting the publication date to pass so that these books are sent out. From the first page the information is amazing – I lived in London for three years and had no idea about so many of the things that I sometimes saw and did not know the background and there are loads of pieces of information here that I never knew even existed and people walk by and never see them. A silly example of noses sticking out of structures, especially Admiralty Arch and walking through and not seeing it. So many things have been described that I know I have walked passed and never noticed. This book is a pure goldmine of fantastic information and I loved it from start to finish. Any visitor to London should be advised to get a copy beforehand so that they can go hunting for the more obscure landmarks and experience real history. As I read this book I kept telling my husband lots of titbits of information just to ask him – “Did you know that?” It is a fun book and I highly recommend it to anyone who visits the capital. It is hard to review a niche book like this but I did enjoy it a lot, found it interesting and when it is published I will promote it from my London blog. This was a pretty fascinating read. 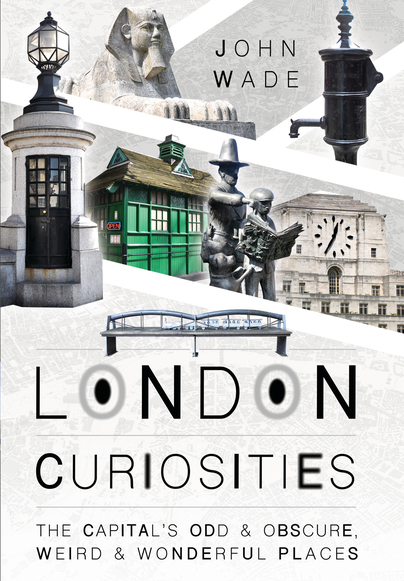 Packed full of hidden gems, this book takes you around London's curiosities, detailing long forgotten pieces of history. The best part of this book also happens to be the worst part... it features tons of unique pieces but at the expense of in-depth knowledge. I found myself wanting more than the page or two each "curiosity" was given, and the fact that I had so much information being thrown at me in such a limited space has sort of jumbled the facts in my head. I'd call this more of a coffee table book, something best picked up here and there, where you can process each piece without immediately flowing into more. I've never been to London, but I'll certainly be rereading this before I finally do go and making sure I check out some of these weird and wonderful places! A great alternative history of London. Many people wouldn't think to learn about what's provided in the book, or to follow-up after they had seen something unusual in the streets. A fantastic look and what makes London so great! I love London, but always feel that there's so much about it that I don't know. This book is an absolute gem for people like me who know London reasonably well, but want to know more about the quirks and the less obvious but fascinating things that the city has to offer. I'd recommend this to anyone who is interested in London's history, especially those who want to explore the curious and quirky elements still visible on the streets today. I'm one of those people who love the old stuff. Buildings, furniture, and monuments. This book was perfect for me. There were enough pictures to make me happy, although I'll bet they'll be so much better in a real book, and not the e-book! Loved the background information. Yep, I'd recommend this book. Its a measure of how enjoyable the book is that I immediately wanted to visit the Curiosities in person and experience them for myself! Now excuse me, I must go prepare an itinerary for my next trip to London that includes the site of the Texas Legation, London's smallest memorial (two mice fighting over a piece of cheese), and the place where the Mayflower really began its epic voyage to the New World in 1620 (at Rotherhithe, South London). I’m one of those nosy people who love to know what every building they see houses, why it was built, and what happened on that spot hundreds of years ago. This book was perfect for me. What is that round church like building in King Edward VII Memorial Park? Or what is that immensely ornate building really used for? What’s the truth about the Camden Catacombs? Why are there so many Egyptian monuments in London? Why are pineapples used to decorate bridges, cathedrals, and railings? All of these questions are answered. Some of the answers are surprisingly complex. It’s arranged into 14 chapters each made up of many smaller sections. Wade included many interesting pictures. The only thing it needed to be perfect was a map. This was an enjoyable read for those who think they know London or for others on their first visit. As is made clear London is full of curiosities and these can be seen throughout the City many of them in most unexpected areas and locations. I liked the fact that some date from two thousand years ago, there is an extensive section on what Roman antiquities can be seen and also there are more recent ones. I was particularly interested in the Alfred Hitchcock curiosities that can be found in Leytonstone, the memorials to the Pilgrim Fathers in Rotherhithe and the Egyptian influences to be found in the streets of Islington. The next time I'm in these areas I will certainly be having a close look. The photographs and illustrations are helpful and enhance the narrative. This is a great book to have in your bag or rucksack when you go out walking in London and explore those things that others may walk by entirely unnoticed. It gives nice little tales of things you might not notice but will now if you are around London and even better if you live in London, also with nice pictures so you can know what to look for or what the book is telling you about. For me I find it a coffee table pick up and read a little and put down but enjoyed learning all about things we don't often notice. I’d recommend this to anybody who has been to visit London and plan to go again or even those like me who have never been and plan to go one day. This will definitely help you make your plans on where to visit - historically speaking. What a fascinating read! An informative and often surprising journey around London and it's historical buildings and points of interest. Interesting idea, but many of the curiosities are just not very curious. Although I now live in Australia, I was born and grew up in Kent, not far from London. I went to the city often and believe I know it reasonably well. However, I am always fascinated to learn more, so this book appealed to me the moment I saw it listed on NetGalley. I was thrilled when the publisher approved my request to view it, and when I read it, I wasn't disappointed. Some of the fun, quirky facts Wade shares, I already knew. Nonetheless, there were plenty of things I'd never noticed or realised about familiar places and objects, so it was enthralling to discover the truth about them. I will certainly seek out a few of the spots Wade mentions on my next trip back to the UK. I would recommend this book both for Londoners keen to know more about the fascinating city in which they dwell, and for tourists keen to explore off the beaten track. My father was born and raised in London (Walthamstow), and though he never returned after a brief visit for Elizabeth’s coronation, I grew up listening to his stories about his own childhood in London during the Blitz. I was thrilled to be granted an advance copy of this book that explores the lesser known and more unusual sites of one of the greatest cities in the world. Explore hidden “treasures” left behind by the Romans, go underground and see the tunnels where people waited for the all clear to sound after an air raid, see the homes and businesses you won’t be shown on any local tours and much more. Photographs, both current and historic, give readers a clear view of the hidden wonders of London. Highly recommended for anyone who lives in or near London, or just those who wish they did. I wish my dad had lived long enough to see this book, I’m sure it would have brought back many memories. John Wade began his journalistic career on local newspapers, where he worked his way from junior reporter to deputy editor. He was editor of the UK magazine Photography for seven years before becoming a freelance writer and photographer thirty years ago. He has written and illustrated numerous articles on camera history for photographic and collectors’ magazines in the UK, America and Australia. He has also written articles on social history for magazines in the UK, and is the author of more than thirty books, published in the UK and US.